It seems that General Ahmed Shafiq did not properly calculate the consequences of his decision to suddenly announce from abroad his bid to run in the 2018 presidential election. 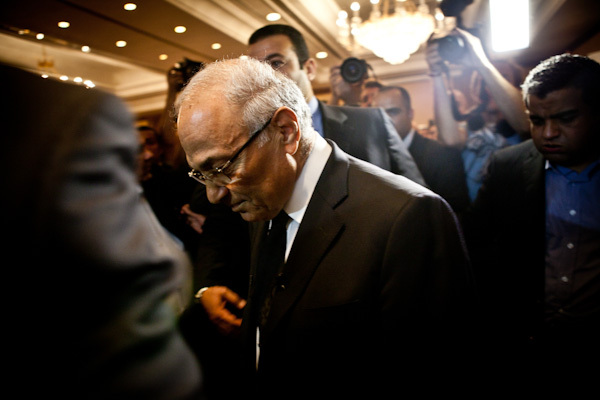 While his 2012 campaign saw him only narrowly miss out on the presidency, Shafiq’s assumption that standing as a candidate in the upcoming election would give him immunity indicates he did not fully comprehend the changes in Egypt’s political climate, where the security apparatus’ control is prioritized over all other aspects of political life. Certainly, Shafiq has a right to run in the election, and there is no doubt that elements of the campaign already launched against him are obscene, unjust, and harm the state and political system. However, the question remains: how did Shafiq make the decision to announce his candidacy in the election before returning to Egypt? It is clear that the General anticipated his candidacy would stimulate the stagnant water and generate public and political solidarity for his campaign, especially since he secured a strong 12 million votes in 2012. But it seems Shafiq overestimated the political climate in the country, as people are currently not included in any political equation. Regardless of support or opposition, there is no political life in the country he can expect to energize by announcing his candidacy. Shafiq is not an Ayatollah Khomeini-like figure to lead a revolution from exile with an ideology to mobilize millions of demonstrators in the streets, but he is a national man whose roots come from within the government and represent another wing of the same regime. He had the courage to face the Muslim Brotherhood in a democratic vote when many who raised their voices had disappeared, but his candidacy should not be perceived as an act of revolution, but rather, a calculation that is subject to profit and loss. The profit estimates say that the man who has been living in exile for over five years must first return to his country and communicate with former colleagues in the security forces; he must hear their opinions on his candidacy and communicate with former supporters – many of whom now support President Abdel Fattah al-Sisi. Makram Mohammed Ahmed, the head of the Supreme Council for the Regulation of the Media, wrote in Al-Ahram newspaper that he spoke with Shafiq six months before Shafiq’s presidential candidacy announcement and advised him not to run in the elections. This could indicate that Shafiq may have been actively been seeking to establish dozens of contacts on Egyptian soil, in order to get a grounded grasp of the situation for politics and security in the country. Certainly, there is a vast number of Egyptians who would support his bid, even if Egyptians disagree with his policies and what he stands for, many would be willing to support him for the sake of opening the public and political arena. In reality, however, Shafiq has come under great pressure. Public support for him, as well as other candidates, is absent, and the tools for generating support remain in the hands of those in power. There is no immunity for any potential candidate, even one as established as Shafiq, who was considered a hero in the October war, and who opposed the Brotherhood through a respectable and fair democratic mechanism of popular voting yet is now smeared as ‘one of them’. The pressure exerted on Shafiq is significant and was most likely unexpected. Whether he competes in the presidential race or withdraws his candidacy, his decision to announce the bid before returning to Egypt seems premature. A security-centric perspective considers it imperative to restrain Shafiq’s candidacy because he could create a sense of a political community. However, it is wrong to apply such a perspective on a permanent basis, or even throughout the foreseeable future, as a country cannot be managed purely through security in the absence of people and politics.